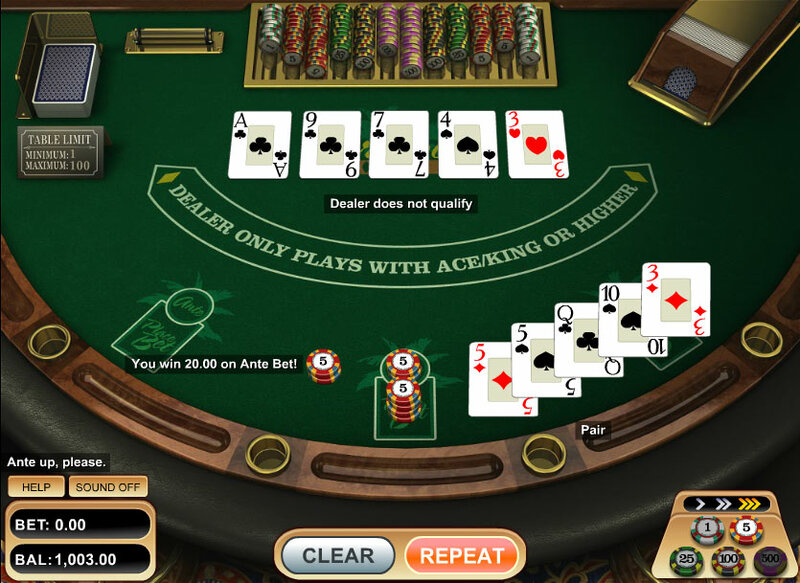 The Caribbean Stud Poker and Caribbean Poker is a version of Poker 5 Card Stud. It is a derivative which runs like a version of blackjack, where you fight against the bank and not against other players as in most variants of poker. The players pay their antes before the game, and after the cards are dealt, the player can bet in terms of its hand. He decided at that time to continue or to double the ante bet. In most successful versions, it may pay the ante to replace a card in his game. The gains are generally paid according to this method: a pair 1x, 2x 2 pairs, three of a kind 3x, 4x color, straight 5x, 7x full, square 20x, 50x straight flush, royal flush 100x. Caribbean Stud Poker free flash that we offer you will familiarize yourself with this pattern of payment. A simple and effective for those who like poker anyway!